fuel for thought: A pickup truck with an LNG tank? That’s very cool. A pickup truck with an LNG tank? That’s very cool. Expect a few double-takes at the Westport booth during the ICUEE Demo Expo in Louisville this week, when we debut a very ‘cool’ prototype: a Ford F-550 bi-fuel operating on gasoline or liquefied natural gas (LNG). You read that right – LNG. This concept vehicle is believed to be the first of its kind, and will feature the Westport™ iCE PACK LNG Tank System, designed for use with spark ignited vehicles. Westport currently produces the Westport™ WiNG Power System, which is also bi-fuel, but uses compressed natural gas or gasoline. Current industry standard systems require warm (saturated) LNG. The Westport iCE PACK offers fuel-flexibility with the ability to carry both cold and warm LNG. By carrying fuel as cold LNG, it can extend fuel storage times and improve vehicle range by up to 10 percent. Assembled at Westport’s technical centre in Plymouth, Michigan, the concept vehicle features a lengthened service body and 70 gallon tank. 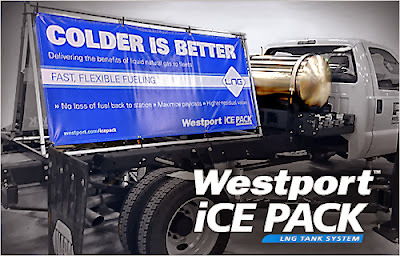 While Westport iCE PACK was originally developed as a product for Class 8 over the road vehicles – and optimized for the Cummins Westport ISX12 G engine – the idea for this configuration was raised by a major fleet company currently using LNG, who were interested to see if it could be done. Visiting the Demo Expo? Come by and see us at Booth N2001.